Panel spokesman calls analysis "a health insurance company hatchet job"
WASHINGTON (CNN) -- Health insurance premiums for the typical American family would increase by another $4,000 by 2019 under a key Senate overhaul plan, according to an industry trade group analysis. 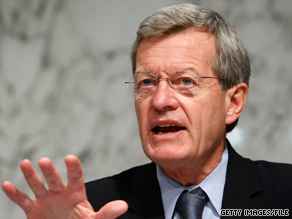 Sen. Max Baucus' Finance Committee is likely to vote Tuesday on an $829 billion bill to overhaul health care. The report raised new questions about the political viability of the 10-year, $829 billion compromise bill drafted under the guidance of Sen. Max Baucus, D-Montana, chairman of the Senate Finance Committee. The Finance Committee is expected to vote on the plan Tuesday. The vote represents a potential turning point in the health care debate. Baucus' committee is the last of five congressional panels to consider health care legislation before debate begins in the full House of Representatives and Senate. The report from the group America's Health Insurance Plans concludes that, under the Baucus plan, the costs of private health insurance would rise by 111 percent over the next decade. Under the current system, costs would rise by 79 percent, the report said. Premiums for individuals could rise by an extra $1,500 if the Baucus plan is implemented, the report said. It said premiums will rise faster under the Baucus plan in part because it doesn't do enough to require individuals to purchase coverage. A failure to draw enough young, healthy people into the insurance system would drive up rates for everyone else, the report concluded. Under the plan, individuals who did not buy coverage would face a fine of up to $750. The White House blasted the report Monday, calling it inaccurate and self-serving. "This is a self-serving analysis from the insurance industry, one of the major opponents of health insurance reform," White House spokesman Reid Cherlin said. "It comes on the eve of a vote that will reduce the industry's profits. It is hard to take it seriously. The analysis completely ignores critical policies [that] will lower costs for those that have insurance, expand coverage and provide affordable health insurance options to millions of Americans who are priced out of today's health insurance market or are locked out by unfair insurance company practices." Finance Committee spokesman Scott Mulhauser called the analysis "a health insurance company hatchet job -- plain and simple." The analysis from America's Health Insurance Plans, first reported by The Washington Post, was conducted by the firm PricewaterhouseCoopers. A separate analysis last week from the nonpartisan Congressional Budget Office concluded that the Baucus bill would reduce the national deficit by slightly more than $80 billion over the next decade. The office asserted the plan would provide insurance to an additional 29 million people and extend coverage to 94 percent of the country's nonelderly population. The measure initially was drafted after months of negotiations among the Finance Committee's so-called Gang of Six, a group of three Republicans and three Democrats. It represents the only proposal so far with the potential to attract any Republican support. The Baucus plan is also the only plan under serious consideration that excludes a government-run public health insurance option. Several top Democrats -- including House Speaker Nancy Pelosi of California -- have questioned whether it is possible contain costs without creating a public option to serve as a check on private insurers. Republicans and some conservative Democrats oppose the government-run insurance option, saying it would drive private insurers from the market and eventually bring a government takeover of the health care system.